It's Easter Bunny time. Our model today is Smokey, a Netherland Dwarf, one of a long line of rabbits owned and cared for by my nephew Tom Underwood down in Devon. 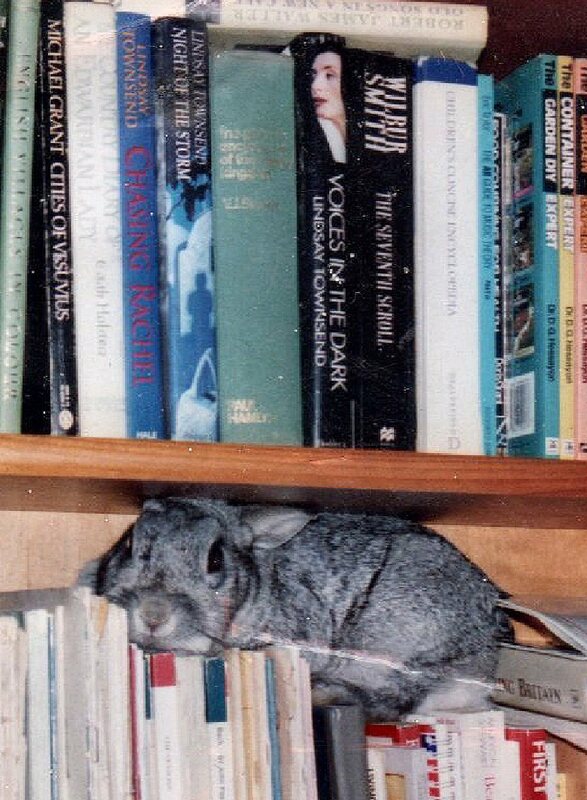 Apart from being healthy, inquisitive and housetrained, Smokey clearly had immaculate taste in reading. On the top shelf are some of my English editions, including Chasing Rachel, which is coming out again this year in a revised download from Bookstrand. In fact, the edits for Chasing Rachel turned up this morning, so I know how I'm going to be spending Easter. It has to be more relaxing to be a bunny. Have a wonderful Easter holiday, Lindsay! Sounds like a great read. Have fun with new edits. Thanks, Kaye! Hope you also have a super holiday! Aw, is that not just the cutest wee Easter Bunny!! Happy Easter, Smokey and Lindsay, and congratulations on Chasing Rachel coming back on the market - I'll be looking forward to that hugely! Thanks, Jane! Happy Easter to you and yours, too! Thanks, Savanna, for both comments! A wonderful, happy Easter for you, too - may all your dreams come true. Happy Easter! Hope the bunny doesn't eat your books! Hi Julia - Happy Easter to you, too! No, Smokey is a very well behaved bunny!